The double disc refiner consists of a refining chamber, a transmission mechanism, a base, and an electric motor. The refining chamber is formed by two fixed grinding discs fixed to the casing and the moving seat and two rotating grinding discs mounted on the rotating disc to form two grinding zones. The slurry of the Double Disc Refiner enters the center of the grinding zone by two feeding pipes, passes through the grinding zone under the action of centrifugal force and feed pressure, and completes the beating process through the squeezing of the spurs in the grinding zone. Equipped with automatic control system to achieve constant energy consumption or constant power beating, the beating effect is stable. By changing the different tooth shape of the grinding sheet can meet the pulping requirements of various pastes. 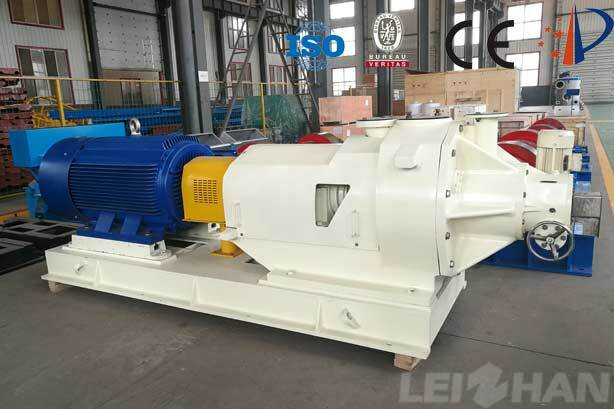 Welcome to consult with us the price and more details about the Double Disc Refiner, our company Leizhan Technology Paper Machinery will offer every costumer good service and advance machine for paper mill.